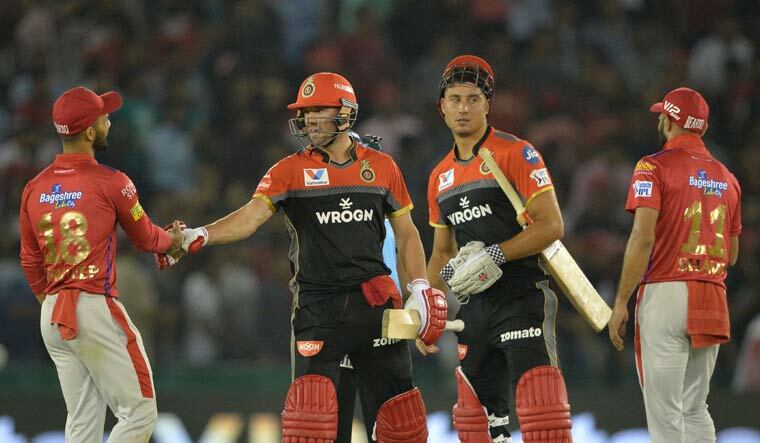 Sensational fifties from Virat Kohli and AB de Villiers overshadowed Chris Gayle's unbeaten 99 as Royal Challengers finally snapped a six-match losing streak this IPL season with a eight-wicket win over Kings XI Punjab in Mohali on Saturday. Chasing 174 to win, Parthiv Patel and Kohli gave RCB a flying start, amassing 43 off 23 balls but the left-handed opener was caught by Mayank Agarwal off R. Ashwin in the 4th over. Kohli completed his second fifty of this IPL season in 37 balls but runs dried up a bit in the middle with M. Ashwin (24-0) and Andrew Tye (4-40) bowling a tight over each. Mohammad Shami then gave Punjab a glimmer of hope when over he dismissed Kohli, who pulled one straight to M. Ashwin as RCB slipped to 128 for two.